Saturday ride, Oct 31, 2015. Wakeup temp 2C. Riding up to the parking lot with an FJR1300 rider wearing what looked to be Glen Greencorn's aerostich suit. Hey, it was Glen. Surprise visit with a new FJR. Bill Hayter soon followed. John and Carla Dwinell was already at Tims but not riding today. Glen also begged off citing paperwork and chores prior to an anniversary the next day. So Bill and I headed out via the #3 on the southern route to Chester. Temperatures were slowly rising but the sun was shining and the ride was pleasant along the coast. We met up with John Dorman in Chester and had a warm up java. From there more coastal riding to Lunenburg via the Maders Cove Rd south of Mahone Bay to Sunnybrook grazing second and first penninsulas. 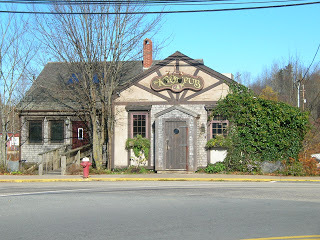 We made our way the THE KNOT Pub in Lunenburg for a lite lunch. 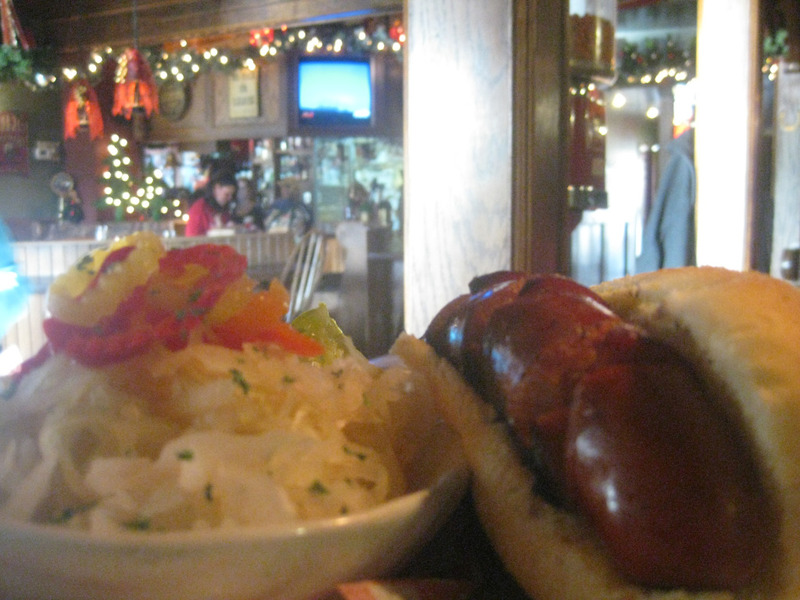 See Knotwurst and Kraut image below. After lunch we partes ways with John who was going to head back to Valley via The Forties settlement. 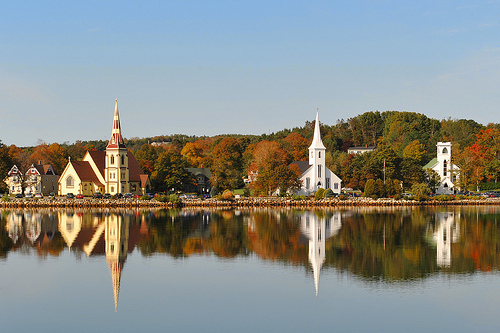 Bill and I basically retraced our steps to Mahone Bay, riding by way of Indian Point . ,After Chester we opted for a ride around the Aspotogan Penninsula. More sun, ocean and the marine aroma of low tide. Did I mention clear skies and colour everywhere. Oranges, Yellows and red with the ever-present dark greens of the firs. This ride goes into the Beautiful and Crisp category. Chickenburger on Thursday, ride on Sunday. The weather looks good for tomorrow, so turn out for the quickly diminishing Chickenburger gathering around 6. (Only a few of us last week!). Also come out and participate in the Sunday ride if you are free. Bedford Commons Tim's @10 am. Get some Fall Colors in your heart! Editors Note: Get some Fall Colours in your heart! - Not under your tires! 2015 Oct 12, Thanksgiving day ride. An email notifier went out late Sunday; apologies for the late notice. north westerley direction towards Windsor in case some riders wanted to meet up with us there. Stanley, Mosherville and on to Brooklyn and Windsor. There we met up with John E. and Chris Lipscomb arrived shortly after we got our order. 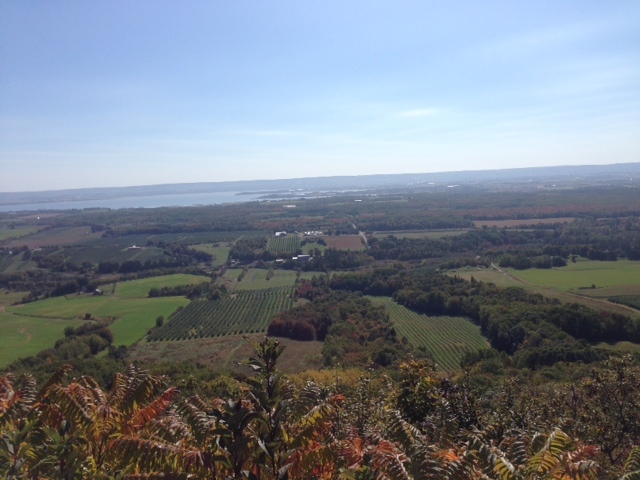 river to Gaspereau,White Rock, greenich, Port Williams, Canning and then to a busy Lookoff. Must've been 20 C by this time and thus layers were shed. Met with acquaintances and after a break we (3 of us) departed in search of some lunch fare. The Canning café was closed and we decided to hit the Tims in Wolfville. After a snack we rode outta Wolfville via the Gaspereau valley again and got on Highway in Avonport. A gas stop at the Windsor exit and then to points home. A great day for an outing. 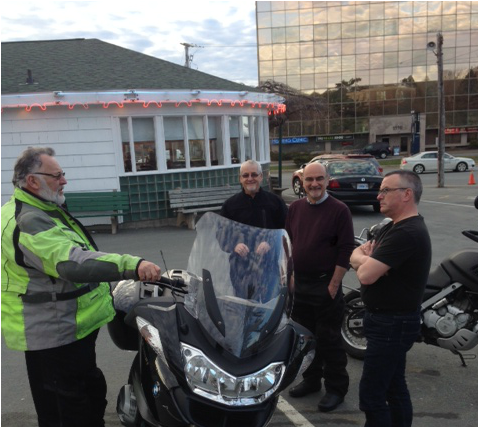 Below we have Bill Hayter, Chris Lipscomb, John Engweiler and Gerald Lefort sharing opinions about something on Chris' bike. Below are Tree and Lorne sharing thoughts about how to improve a DR650 Suzuki. 2015 Oct 4, sunday ride called despite email problems. Keng discovered that the method used to notify members of club ride has apparently identified us as Spam and did not send the notice the the membership at large. We are working at rectifying this with some type of group mailing. So we posted the ride notice on the website. We apologize if you missed it. Bill Hayter and I (Amédée) did however form a group of two and proceeded to ride towards the valley via hwy #1, #202 to #236 to Brooklyn and on to Windsor for a Break. Weather was cool, starting off but sunny and warmed up nicely as we got to Windsor. After Windsor we headed towards Martock via Curry's Corner and #14 all the way to Robinson's corner and then Chester. A slow ride through Chester and another stop at Tims on the #3. After a java we headed back towards town under fair and sunny skies. Got home with enough time to do yard work before receiving a guest for supper. A good day to ride or whatever you were up to. After an online poll which returned an even number of members preferring one of two weekends suggested it was decided to hold our ride on the weekend of 25-27 sept 2015. This was largely based on weather predictions and rider preference. Because a friday departure we also reserved rooms at the Trailsman in Nyanza, and easy ride to and from on friday and sunday. 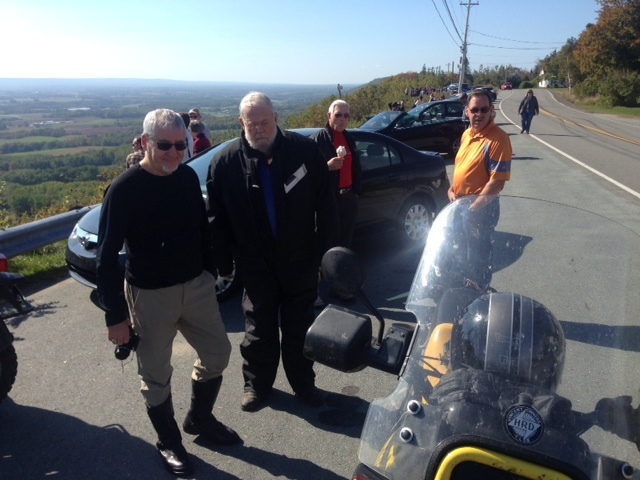 Alan Coles, Ken George, Glen Greencorn and Amédée were the riding group represented in this years Fall Colours ride. Tall tales dominated the conversations on Friday evening with a supper at the Red Barn restaurant. Saturday morning showed it had showered overnight and blue skies were breaking through as we had our included breakfast at the Motel dining room. The highway into Baddeck was drying up by the time we got on the road. Temps wer around the 8-9 C range. A fuel stop in Baddeck and we then headed to Englishtown to take the ferry crossing. Ken treated us to the ferry crossing and we were quickly on the 'other side'. bypassing road construction on the St. Ann.s loop ( we had heard about). 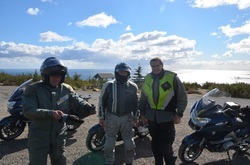 The next stop was the scenic lookoff at Cape Smokey after a brisk run up Smokey. A brief stop in Neil's Harbour to check for emails about an inquiry on a K75 that was for sale there. We were pleasantly surprised that the stretch of pavement from Neil's Hbr to White Point had been totally redone. What has been a bone shaker for the last decade or more is smooth as silk. The rest of the shore road to Cape North was very nice as well. Next stop was a scenic look-off at the ascent of North Mtn. beautiful view of Sunrise Valley and a chance to adjust the gear. On to Pleasant Bay and a lunch at the Rusty Anchor. Seafood chowder and other fish dishes did not disappoint here as usual. Glen parted ways in Pleasant Bay because he had professor duties the next day - early. Back on the road and another brief scenic stop at the descent of French Mtn. The view of the coast looking South never fails to disappoint. 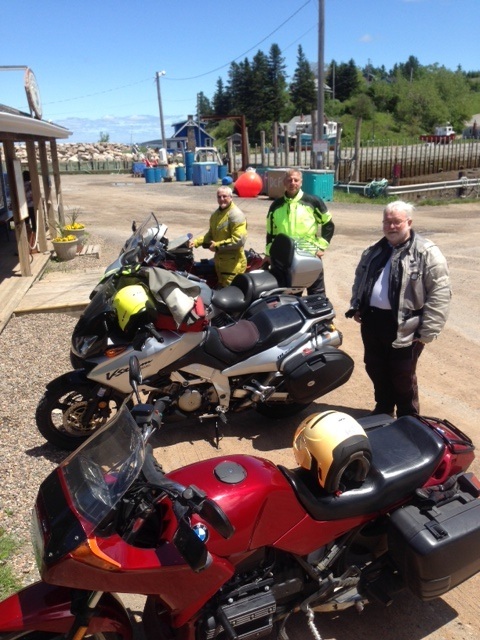 Another brief stop in Chéticamp to chat with the ATS (Antigonish Touring Society) who were starting to meander towards the Doreyman. We exchanged pleasantries and headed south towards Magaree riding th west side of the Margaree Valley to Magaree Forks and then through areas such as Lake O'Law, Middle River, Hunter's Mtn and on to the Red Barn. I refueld at Nyanza and checked the Big Spruce brewery but they only sold growlers so I did not partake. Sunday morning was another crisp one. 14-12 C temps were experienced during the day throughout the weekend. By the time we returned to metro it was around 18 C.
2015 June14, 2015 Rode to valley and Harbourville. Amédée was at Bedford Commons to meet any toher riders and was swamped with a harley group using this locale as their starting point. 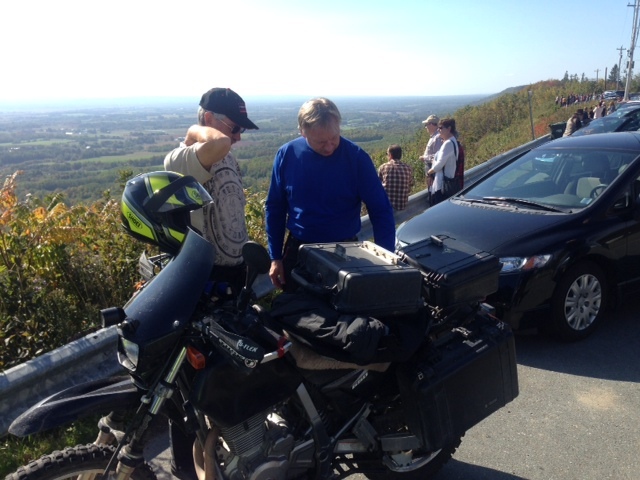 Lorne Piercey showed up shortly before 10:00 on his BMW R1200CL. We left shortly after 10:00 and rode the 101 to 1 to 202 to 14 to 1 to Windsor Water St. Tims where we met up with John Dorman and Bill Hayter. After a leisurely break over coffee John led us through: the Bog Rd to hantsport to West Brooklyn Rd. to W. Brooklyn Mountain Rd. 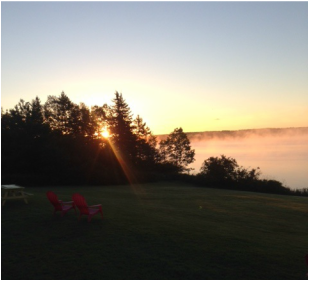 to Gaspereau River Rd to White Rock Rd.to English Mountain Rd. to Prospect Rd.to Cambridge Mtn Rd. to Randolph Rd. Back on the #1 hwy we then exited right on Maple St. and a left/right onto Black Rock Rd. to hwy #221. 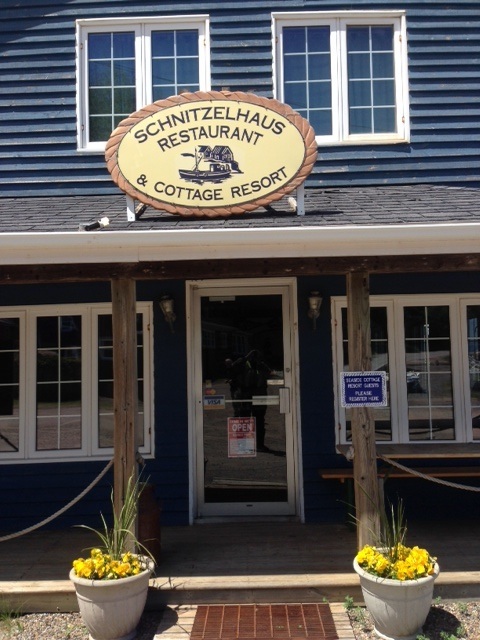 A left here until the Harbourville turn off and onto hwy #360.and straight on to Harbourville for a stop at the Harbourville Schnitzelhaus Restaurant. It was their first day opening so we lucked out. Sausage conbo and potato pancake / salad were hit the spot for these riders. Having pre-determined schedules for the rest of the day: Bill headed towards Peter R.'s, John to Tony M.'s, and Lorne and I opted to slab it back the metro. A good ride had by those who partook. 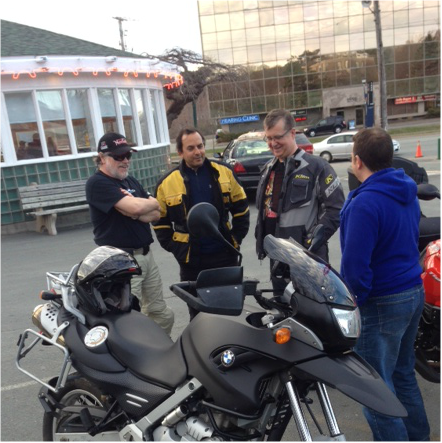 John E., Bill H., Lorne P., Bruce K., and Mark Mayer gathered at Bedford Commoms Tims for this sundays ride. With little fanfare the group departed towards the south shore to Chester. Lunch was at the Stretch Diner. Subsequent routing took the group up the #14 hwy to Windsor and then points home. Good ride had by all. A sampling of the DownEast participants. Day1 - Bedford to Ellsworth. 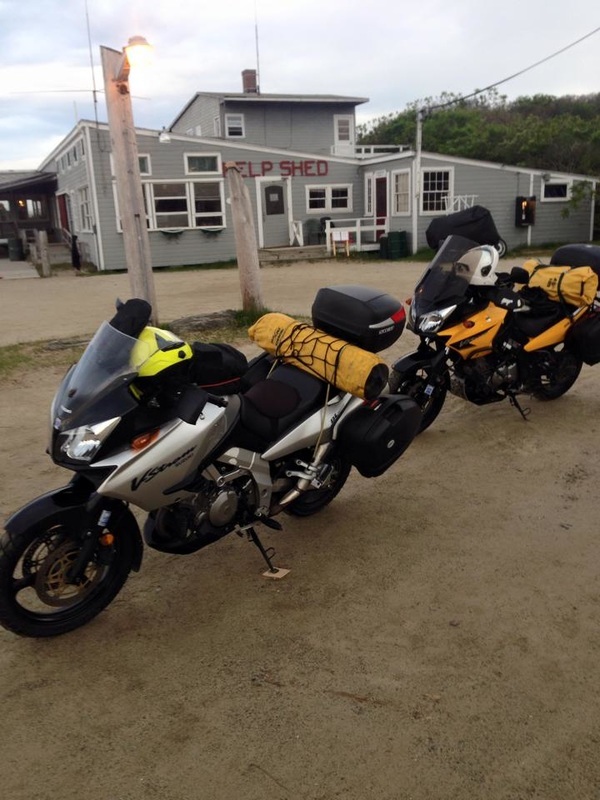 A group met at Bedford Commons on the morning of May 28th 2015 to start the trek to the DownEast Rally. Other groups had their own agendas and the final tally for NSers attending the rally was 20 riders and passengers. Bill, myself, Rob and Ian stopped in Truro to pick up Chris Lipcombe who arrived shortly after us with his 'Outfit'. We were met with high cross winds on our ride through the Tantramar Marsh. This location is now the resting place for my RKA tank bag map cover. There's no way I could catch while battling the crosswinds. Chris i packing while on the road. St. Stephens around the noon hour. While gassing Chris motored on by and said he was picking up some deliveries at a Package depot - the location of which we did not know. A slow ride throught the main drag in Calais and the green outfit was easy to spot. We pulled in see Chris already packing his orders of parts into the sidecar. You can pack a lot of stuff in there! Took Rte1 all the way to Ellsworth and checked into Eagles Lodge. Supper at Jaspers with thunderstorm visible in distance. Rained while we were having our meal. Letting up by the time we walked back. Day2 - Ellsworth to Hermits Island. 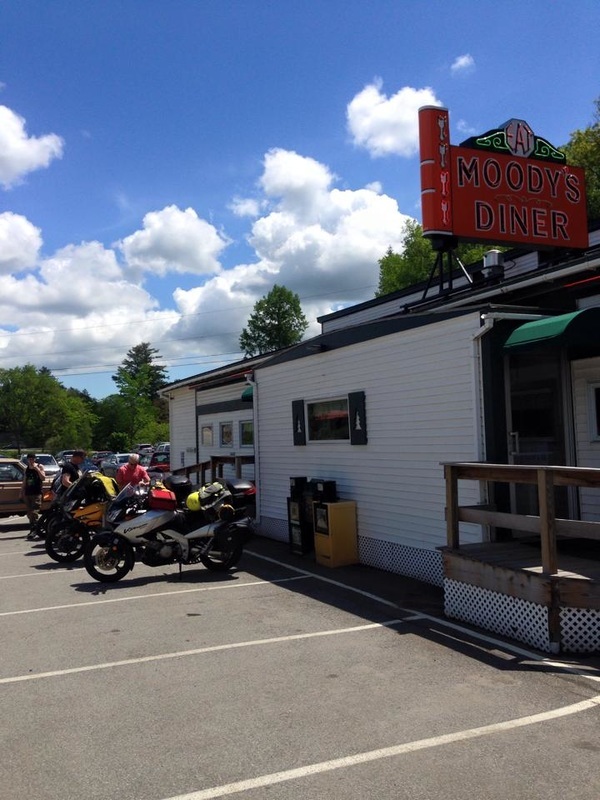 Scenic ride on Rte 1 to Bath, taking in a lunch at Moodys in Waldoboro. Meandered to Hermits Island from Bath arriving at around 12:30 pm. Registration, camp setup, meet fellow arrivals and check out other campsites to greet other NSers or old friends. Regrouped for ride to supper at Thai Gardens for 6. Good food and company. Drunken noodles, Buffalo Chicken, Peanut Curry seafood platter, Some kind of Duck, Vegetable fried rice with pork, and a few more I forget the names of. Retired back to campsite with visits to Kevin and Donna's campsite for a chat before hitting the sack. Also there were Michelle and Wade Rogers. Jim Gates was nearby at his newly appointed groto with attached M/C garage. Day3 - No hard plans, visited Street Cycles in Falmouth where we met many from our 'group'. For lunch, some went to the bakery next door while Bill and I opted for a lunch at Linda's Beans Maine Kitchen in Freeport. Met up with Rob and Ian and Shereef and Nagaya at Ben & Gerrys for an ice cream treat. Day4 - Ride home. Woke up prior to daybreak to moderate temperature and dry weather despite fears of impending rain or heavy rains. We also managed to capture some blue skies in unretouched photos. We had showers on the way to Bath/Brunswick and these cleared up. Intermitent rain to Saint John and then pretty much wet the rest of the way home. The Tantramar March were tame but did not return my map cover. Lots of rain Truro to the airport. Received a call later in the evening from Aln Coles who passed Bill and I near the scales in Enfield. To my knowledge everyone got home safe. 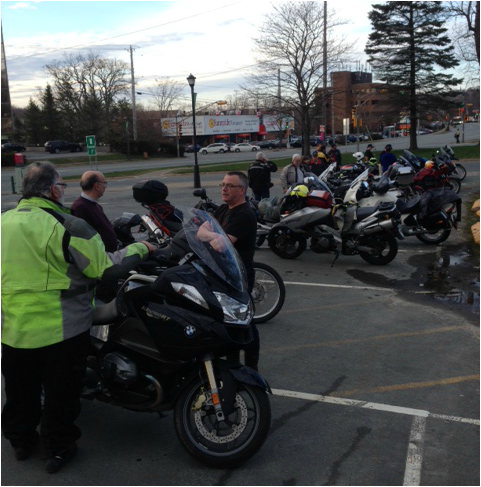 About 16 + 2 riders showed up to meet at our new Thursday evening venue. There were members and friends from metro, surrounding areas and the valley present. It was good to see some happy faces, now that the snow is gone. Ride to ColdBrook Tims in the valley via Rawdon hills, i.e. No. 1 to 202 to 14 to Brooklyn and then onto the Highway 101 to the Tims in ColdBrook (exit14). Initial group was composed of Amédée Aucoin, Bill Hayter and Glen Greencorn. Picked up John Pineo, John Dorman, Chris Lipscombe and Peter Roleau in ColdBrook. Went to Scots Bay for lunch to find 'The Haze' was closed. Retreated back to the lookoff to find Ken Jarvis and Chuck Sweet taking in the sights. Then went to the Fireside Café in Canning for some lunch fare. Headed home around 2:30. Temps leaving Bedford approx 5C, climbing to mid teens under sunny skies. Ride to Look Off in the valley via Rawdon hills, i.e. No. 1 to 202 to 14 to Brooklyn and then a pit stop in Windsor. Group was composed of Amédée Aucoin, Bill Hayter, John Engweiler, Wayne Maclean and Glen Greencorn. Temps in Rawdon 2.5C, on way to lookoff and home about 9.5C under overcast skies.